Five test coil systems have been built for investigation into the basic operational characteristics of the coilgun. 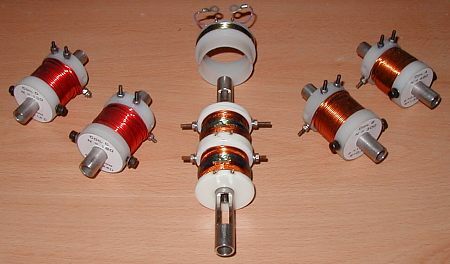 Four general purpose single stage test coils have been constructed. These coils consist of a stainless steel tube, nylon end formers and the coil winding. One of the formers is cross drilled to accept an optical gate sensor. In addition to the 'drive' coils there is also a sensor coil wound on its own former. This can be transferred between the drive coils for making induced voltage measurements as well as testing single stage induced voltage triggering systems. 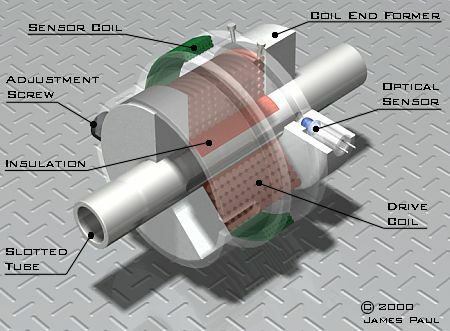 Fig 1 shows a cutaway diagram of the coil features. The tube is slotted to reduce the eddy currents induced by the dynamic magnetic flux. Ideally a non-conducting tube should be used but the slotted stainless steel tubing is a viable alternative. A layer of heatshrink insulation is fitted over the tube between the formers. This prevents a possible short circuit between the winding and the tube. The windings are impregnated with acrylic lacquer to bind the coil together. This is useful in distributing the electromechanical loading on the turns. There is a bit of variation in the dimensions of the coils. I had intended them to be almost spot on 26mm in length but it didn't turn out quite that way. 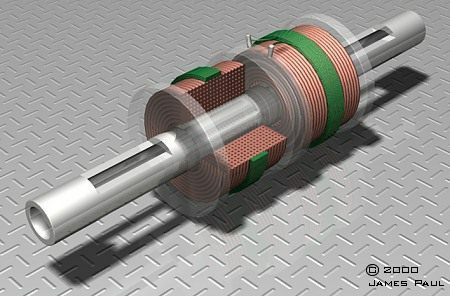 Fig 2. shows the two stage coilgun which is intended for preliminary testing of multistage induced voltage triggering. The coils are wound on individual nylon formers which are permanently glued to the slotted stainless steel tube. The sensor coils are wound directly over the drive coils and are positioned centrally along the coil axis. The sensor coils were wound with nylon end support rings clamped onto the drive coil allowing a compact multilayered coil to be formed. Acrylic lacquer was sprayed into the coils and, when set, the support rings were removed. The windings were then lightly coated in epoxy to give some additional strength.